Several animals spit, and they do so for different reasons. From insects to fish to snakes and even large mammals, animals have been known to spit for fun, for protection, in procreation, in anger and even to help secure dinner. Humans can spit water, but animals can spit water, venom, stomach slime and even foam. The camel family includes llamas, camels, certain alpacas, guanacos and other camel relatives native to South America, as well as camels themselves. When members of the camel family are upset they spit stomach juice in the face of the annoyer, even if that happens to be a person. Therefore you should always be careful not to aggravate these creatures. Even the tame ones in zoos will resort to their natural instinct and spit at you when angered. The spitting cobra utilizes muscle contractions to squeeze glands in its mouth to accurately shoot venom at possible predators to protect itself. This process isn't actual spitting, but it's hard for an onlooker to tell the difference. 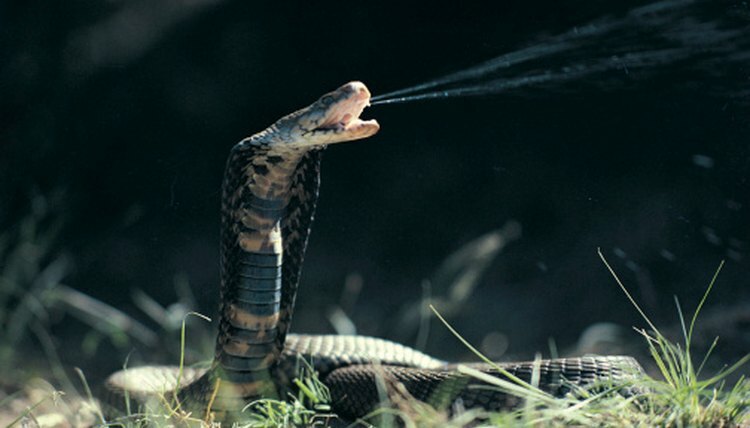 The spitting cobra has been known to shoot venom for a distance of more than 6.5 feet. The archerfish hovers near the surface of the water, watching for bugs. When it sees one, it spits a stream of water out of its mouth to where the bug is sitting on a plant. Once hit by the water, the bug is likely to fall off and land in the lake where it becomes easy prey for the sharpshooting fish. The archerfish has mastered the angle at which it must shoot water to knock down a bug. The male scorpion fly uses spit during its mating ritual to attract a female mate. It spits sticky saliva onto leaves for the females to devour as a distraction during mating. This distraction helps the male to survive after the mating has completed; otherwise it would be the female's next meal. Spittle bugs wrap their bodies in a foamy spit to keep from drying out when they are young. The foam also insulates them from heat and cold. These spit-covered youth, known as nymphs, can be found along the stems of small plants. The mighty walrus spits a forceful gush of water at the mud on the bottom of the sea or ocean floor to uncover clams from hiding. This trick is useful, because the walrus has limited eyesight. Walruses are also known to spit out water when just playing around.